After looking at watches day-in and day-out, I’ve found myself to become desensitized to the high prices that come along with a Patek Philippe, Rolex, Audemars Piguet, or Vacheron Constantin. I find myself looking at a $10,000 watch and saying, “wow that’s not too expensive”. Compared to some of the watches on the market, $10,000 is rather cheap. Today I sat back and re-evaluated my perception of “affordable”. 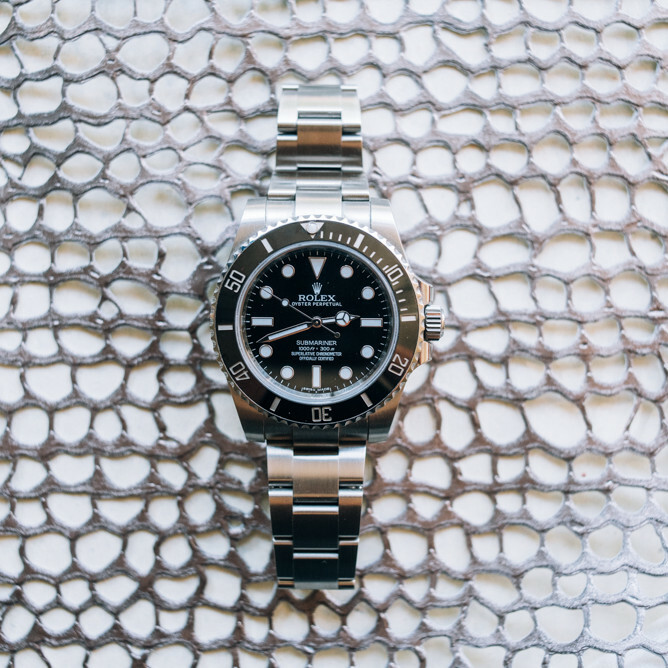 For myself and many other watch enthusiasts, $10,000 is a steep amount to drop on a luxury watch. A watch at that price point is not currently in my budget. When I found this IWC Mark XVIII watch and saw it was priced at $3,950, I immediately was intrigued. The price is affordable for a luxury watch from a well-known brand. Both the price and the clean, understated dial instantly appealed to me. That being said, this watch does have some negative attributes. 1. Clean, easy-to-read dial. The time is front and center with large Arabic numerals and a three-hand display. You can choose between a white dial with black indices and black-outlined hands or a black dial with white indices and hands. Both dials have a generous application of lume. Even after the Super Luminova wears off, you’ll be able to read the time easily. 2. The stainless steel case with a brushed finish adds a nice touch to the overall look of the watch. The finishing was well done, and it does not detract from the dial. 3. With options of a stainless steel bracelet or a calfskin leather strap, this watch can be used for work or weekends without looking out of place. It’s a good, entry-level watch for everyday use. 4.The soft-iron inner case will protect the watch against magnetic fields. Granted, this technology is rather standard in this day and age. 5. This is IWC’s most affordable watch in their Pilot’s watch collection by nearly $1000. If you’ve been eyeing an IWC Pilot watch but couldn’t afford it, then this may be your opportunity. 6. When you buy the watch, you buy the history that comes with an IWC Pilot’s watch. 1. Standard watch with a basic movement. The movement, an automatic Sellita calibre, is reliable but boring. It’s basically a rebuilt ETA 2892 with an attached Sellita SW-300 base. Nothing to shout home about, but it’s well-built and works well for the watch. It does offer a 42-hour power reserve and a date function. 2. You’ll be paying quite a bit for the prestige that comes with owning an IWC. There are quite a few competitively priced watches in this same price point. The alternative watches may not say “IWC” on the dial, but they offer more for your money. You’ll be paying for the watch that you buy instead of the name.To give you an idea of alternative brands, I suggest checking out Stowa, Laco, Damasko, Oris, Hamilton, Citizen, Timex, or Alpina. These are just a few of the available options. 3. As many other watch blogs have already noted, the date window is less than ideal. Because the movement is smaller than the case, the date is further from the dial than many would like. This causes the overall symmetry of the watch to be off-center. Some are able to ignore this odd placement, while for others it’s a deal breaker. One thing to note… if you don’t like the date window in pictures, that won’t change when you see the watch in-person. All-in-all, this watch sticks to the basics. If you like the look and don’t mind paying a bit more for the brand name, then this is a watch to consider. It is also important to note that the 3,950 USD price is when you buy the watch with a leather strap. Buying the watch with a stainless steel bracelet will cost 4,950 USD.